A horizontal bicolour of red and white; charged in white in the canton with a crescent facing the fly and a pentagon of five stars resembling Southern Cross. The national flag of Singapore was adopted in 1959, the year Singapore became self-governing within the British Empire. It was reconfirmed as the national flag when the republic gained independence on 9 August 1965. Prior to its independence, it was the only state flag in Malaysia not to have a 1:2 ratio. The design is a horizontal bicolour of red above white, overlaid in the canton (upper-left quadrant) by a white crescent moon facing a pentagon of five small white five-pointed stars. The elements of the flag denote a young nation on the ascendant, universal brotherhood and equality, and national ideals. Vessels at sea do not use the national flag as an ensign. Merchant vessels and pleasure craft fly a civil ensign of red charged in white with a variant of the crescent and stars emblem in the centre. Non-military government vessels such as coast guard ships fly a state ensign of blue with the national flag in the canton, charged with an eight-pointed red and white compass rose in the lower fly. Naval warships fly a naval ensign similar to the state ensign, but in white with a red compass rose emblem. Rules defined by the Singapore Arms and Flag and National Anthem Act govern the use and display of the national flag. These have been relaxed to allow citizens to fly the flag from vehicles during national holidays and from homes at any time of the year. Singapore was under British rule in the 19th century, having been amalgamated into the Straits Settlements together with Malacca and Penang. The flag that was used to represent the Settlements was a British Blue Ensign containing three gold crowns—one for each settlement—separated by a red inverted pall, which resembles an inverted Y. The Settlement of Singapore had no separate flag, although the city was granted a coat of arms which featured a lion in 1911. During the occupation of Singapore by the Japanese during the Second World War, the Japanese national flag was used on land by the military and during public events. Soon after the Second World War, Singapore became an independent Crown colony and adopted its own flag. It was modified from the Straits Settlements flag to reduce the number of crowns from three to one. [A]lthough we were self governing it was necessary right from the beginning that we should rally enough different races together as a Singapore nation... [A]part from the anthem we have to produce the flag and the crest, we insisted that it was a Singapore state flag and should be flown side by side with the Union Jack. The design of the flag was completed in two months by a committee headed by Toh. He initially wanted the flag's entire background to be red, but the Cabinet decided against this, as red was regarded as a rallying point for communism. According to an account given by Lee Kuan Yew, the Chinese population wanted five stars, which were modeled off the flag of the People's Republic of China and the Muslim population wanted a crescent moon. Both of these symbols were combined to create the national flag of Singapore. On 30 November 1959, the Singapore State Arms and Flag and National Anthem Ordinance 1959 was passed to regulate the use and display of the State Arms and State Flag and the performance of the National Anthem. When presenting the motion to the Legislative Assembly of Singapore on 11 November 1959, Sinnathamby Rajaratnam, the Minister for Culture, stated: "National flags, crest and anthem express symbolically the hopes and ideals of a people... The possession of a national flag and crest is, for a people, symbolic of self-respect." In September 1962, the people of Singapore voted to join the Federation of Malaysia. The process was completed on 16 September 1963, when the Malaysian flag was hoisted on Singapore by Prime Minister Lee Kuan Yew. The Singapore flag was reconfirmed as the national flag when Singapore became fully independent from Malaysia on 9 August 1965. The Singapore Arms and Flag and National Anthem Rules define the flag's composition and the symbolism of its elements: red symbolises "universal brotherhood and equality of man", and white, "pervading and everlasting purity and virtue". The waxing crescent moon "represents a young nation on the ascendant". The five stars "stand for the nation's ideals of democracy, peace, progress, justice and equality". During the second half of the 20th century, the star and crescent symbol came to be recognized as a symbol of Islam, and Singapore's flag came to be seen in this context by the nation's Muslim activists. Singapore and Nepal are the only non-Muslim nations to have a crescent moon in their national flags, and along with Brazil, the only two countries partially or completely located in northern hemisphere to feature the Southern Cross on its flag. The ratio of the flag is two units high by three units wide. For the manufacturing of flags, the Government of Singapore stated that the shade of red used on the flag is Pantone 032. According to guidelines published by the Ministry of Information, Communications and the Arts (MICA), the flag may be reproduced in any size and displayed at all times, but it must be in its specified proportions and colours. MICA recommends the sizes 915 by 1,370 mm (36 by 54 in), 1,220 by 1,830 mm (48 by 72 in) and 1,830 by 2,740 mm (72 by 110 in). The material that is recommended for the national flag is bunting wool. Until 2004, the flag was used exclusively on or in front of buildings owned by the government, ministries, statutory boards and educational institutions on a year-round basis. The flag could only be flown by individuals and non-governmental organisations during the month of August to mark the country's national day on 9 August. During the National Day celebrations period (1 July – 30 September), rules governing the flying of the national flag outside buildings are relaxed. The flag may be displayed on any vehicle (other than a hearse), vessel or aircraft, and may be incorporated as part of any costume or attire, so long as this is done in a respectful manner. These restrictions on individuals and non-governmental organisations were relaxed in 2004 to allow the flag to be flown year-round under certain conditions. A statement from the Ministry of Information and the Arts (now MICA, the Ministry of Information, Communications and the Arts) said that "[t]he national flag, national anthem and Singapore lion head... are our most visible symbols of our sovereignty, pride and honour" and urged Singaporeans to use those "rallying" symbols to "identify with the nation". A giant Singapore flag suspended from a CH-47 Chinook helicopter and accompanied by two Boeing AH-64D Longbow Apaches during a National Day Parade rehearsal on 29 July 2006. Following requests by Singaporeans, guidelines for the use of the flag were further broadened in 2006 to give residents a variety of opportunities to express their loyalty to Singapore during National Day celebrations such as the National Day Parade. MICA permitted them to display the flag on vehicles and on themselves or belongings with minimal restrictions, from the middle of July to the end of August for a trial period. The period was extended in 2007 to three months from July to September. Singaporean citizens, government and non-governmental organisations may display or fly the national flag throughout the year to identify themselves with the nation, and especially encouraged to do so during occasions of national celebration or national significance. Non-Singaporean businesses and organisations are also allowed to display the flag throughout the year. The use and display of the flag is governed by Part III of the Singapore Arms and Flag and National Anthem Rules made under the Singapore Arms and Flag and National Anthem Act. It is an offence to knowingly contravene specified provisions of the Singapore Arms and Flag and National Anthem Rules; the penalty is a fine not exceeding S$1,000. The Singaporean government dictates that no person may treat the national flag with disrespect, such as allowing the flag to touch the ground. The flag must not be displayed below any other flag, emblem or object; dipped in salute to any person or thing; or displayed or carried flat or horizontally, but always aloft and free. Within Singapore, the national flag takes precedence over all other flags, subject to international practice. As such, when it is displayed or flown with other flags, it must be in a position of honour; that is, it should be positioned, where practical, either above all other flags or, if displayed side by side with other flags on the same level, to the left of the other flags (as seen by a person facing the flags). When the flag is raised or carried in a procession with other flags, it must be done so in front of the other flags in a single file, or on the right as seen by the standard bearers if the flags are carried side by side (i.e., on the left as seen by the viewer). The standard bearer must carry the flag high on his or her right shoulder. When the flag is displayed on a platform or stage, it must be above all decorations and be behind and above any person speaking from the platform or stage. If it is displayed from a staff standing on the platform or stage, it must be on the right side of the person speaking from the platform or stage. Finally, when the flag is hung, it must be hung against a vertical wall or other vertical flat surface, with the crescent and stars on the top left position as seen by any spectator facing the flag and the wall or surface. United States President George W. Bush addressing U.S. Embassy staff in Singapore on 16 November 2006. The national flag behind him is defaced with the Lion Symbol numerous times. When the flag is displayed outside a building, it shall be displayed on or in front of the building only from a flagpole. If the flag is flown at night, it should be properly illuminated. The flag must not be displayed on any motor vehicle except on one in which the President of Singapore or any Government minister is travelling on official business. The flag may not be displayed on any private vessel or aircraft. No person may use or apply the flag or any image of it for any commercial purposes or as part of any furnishing, decoration, covering or receptacle, except in such circumstances as may be approved (by MICA) in which there is no disrespect for the flag. Further, it is not permitted to use the flag as part of any trademark, or to produce or display any flag which bears any graphics or word superimposed on the design of the national flag. The flag or any image of it may also not be used or applied as or as part of any costume or attire. The Government may ask for the flag to be lowered to half-mast in the event of the death of an important person or for national mourning. No person is permitted to use the flag at any private funeral ceremony. However, the national flag can be draped on a coffin during a military or state funeral. No person may display any flag that is damaged or dirty. Any worn out or damaged flag should be packed into a sealed black trash bag before being disposed of and not left visible in dustbins. Singaporeans are encouraged to display the national flag outside their homes during National Day celebrations, and residents' committees, particularly those of public housing estates, often arrange co-ordinated displays. However, some Singaporeans decline to do so as they associate it with the People's Action Party, the ruling party in Parliament, rather than with the nation. During the period beginning 1 July and ending on 30 September of each year, any person may, without the need for the approval of the Minister under paragraph (4), incorporate the Flag or an image thereof as part of any costume or attire except that he shall do so in a manner that does not give rise to any disrespect to the Flag. On National Day in 2007 at the Padang, 8,667 volunteers holding up red and white umbrellas formed the largest-ever representation of Singapore's flag at an event organised by Young NTUC, a youth movement associated with the National Trades Union Congress. Outside the National Day celebrations period, the national flag of Singapore is flown from all buildings housing government and government-related departments, such as armed forces installations, court houses, offices, and educational institutions. A picture of the flag is commonly found in each classroom, and schools conduct ceremonies at the beginning of the school day at which the national flag is raised , the national anthem is sung and the national pledge is taken. The national flag is sometimes flown by Singapore-registered vessels, although this is considered incorrect, as such vessels are required to hoist proper national colours either when entering or leaving port. The ensign is red and charged with a circle enclosing a crescent surmounted by five stars in a circle, all in white. The national flag is not used by coast guard ships and military warships; both classes of ships have their own specific ensigns. The Singapore Government makes announcements regarding the lowering of the flag to half-mast in the event of a death of an important personage or mourning affecting the nation. The flag has been flown at half-mast during the funerals of former presidents and senior politicians, and on 9 January 2005 as a mark of respect for those who perished in the 2004 Asian tsunami disaster. Singaporean composer Lim Su Chong composed a song in 1969 entitled Five Stars Arising which took the elements of the national flag as its theme. The lyrics of the song speak of a new moon, five stars and a new flag "arising out of the stormy sea". The moon is "[y]outhful and bright and bearing hope, and tranquil as can be", each of the stars is "a lamp to guide our way; a lamp for all to see" and the flag is "[c]rimson as the blood of all mankind, yet white and pure and free". The song is often sung during National Day celebrations. In January 2003, Singaporean artist Justin Lee Chee Kong was prevented by the Media Development Authority (MDA) from exhibiting a painting entitled Double Happiness— A Fantasy in Red, which consisted of an image of the Singapore flag with various red images of the Chinese characters for double happiness. The move was made on the grounds that "the National Flag is a national symbol and no words or graphics should be superimposed on it". Lee reported that the work was simply a display of one's love for their country and an expression of joy at Singapore's success, and in a press statement, he asked that the piece be "treated as an artistic and complimentary interpretation of a national icon". When interviewed by The New Paper, he said "I know as a citizen that we are not allowed to do it, but this is art and I am an artist." He also complained about double standards as a Chinese artist, Gu Wen Da, had recently exhibited a national flag made of hair at the Esplanade - Theatres on the Bay. Lee felt the use of hair to create the nation's flag meant that the flag was in the wrong colours, and was distasteful. Also in 2003, The Rolling Stones performed in Singapore as part of their 2002/2003 Licks World Tour. At the first performance, there were two inflatable dolls on stage. Both of the dolls had flags placed in their crotch area; one had the Rolling Stones logo and the other had a Singapore flag. Because of the illegal use of the state flag, and for fear of dealing with the government, the dolls and the flags were removed from the second concert by the organizer. In August 2007, a Singaporean pub, Loof, sent an electronic direct mailer (e-flyer) to at least 1,500 members on its mailing list featuring a close-up shot of the crotch of a female model wearing a red swimsuit or pair of underpants bearing the crescent and five stars of the national flag. This was done as part of the pub's publicity campaign for its National Day events. According to Loof's marketing manager, "[T]he ad was definitely not meant as an insult to the country or anyone. I hope that the ad will be taken in the spirit of humour and fun." A majority of people polled by The New Paper felt the advertisement was disrespectful and in bad taste. MICA said that the advertisement did not breach the law as it only reproduced some components of the flag—it did not, for example, incorporate the flag's red and white background together. However, K.U. Menon, director of MICA's National Resilience Division, said: "MICA does not encourage such ads which treat the national flag with disrespect. [...] Symbols should be treated with some measure of dignity and we hope Loof will withdraw the ad on its own initiative." In November 2010, during the Asian Games held in China, the Singaporean men's water polo team's swim trunks came under controversy for inappropriately displaying elements of the Singaporean Flag. Critics deemed the garment insulting and an embarrassment to the country, with the crescent moon positioned in the centre of the brief, directly over the crotch area. The garment had been designed by the team itself but had not received prior approval from the Ministry of Information, Communications and the Arts. However, even after the controversy came to light, the team was still able to continue wearing it as competition rules did not permit changing a team's uniform midway through the Games. The team was apologetic over the blunder and promised to tweak the design after that competition. In addition to the national flag and ensigns, there are other flags used for official purposes. The standard used by the President of Singapore is a modification of the national flag. The crescent and the stars are bigger and centred on a field of red. According to the Istana, the Office of the President of Singapore, the red background and the crescent and stars have the same symbolism as in the national flag. The standard is flown at the Istana from 8:00 am to 6:00 pm, or until the President has left for his private residence. The Red Ensign of Singapore, which is used for Singapore-registered civilian ships, is a red flag charged with a crescent and five stars, surrounded by a ring. The ratio of the width to the length of the ensign is one to two. According to the Maritime and Port Authority of Singapore (MPA), this ensign should be used on Singapore ships instead of the national flag. In a 1999 marine circular, the MPA reminded masters, owners and officers of ships that those who do not use the Red Ensign risk being fined under the Merchant Shipping Act (Cap. 179, 1996 Rev. Ed.). The Singapore Naval Force Ensign was introduced in 1967 by the Ministry of Defence, and is used on all vessels owned by the Republic of Singapore Navy (RSN). According to a construction sheet issued by the Ministry entitled Singapore Naval Force Ensign and numbered Misc. 1 of 1967: "The Singapore Naval Force Ensign shall be a white ensign with the top left hand quarter of red charged with a crescent sided by five stars in a circle all in white and an eight pointed red star with narrow white lines inserted within the star in the lower right hand quarter. The ratio of the width to the length of ensign shall be one by two. The crescent and stars are from the State Flag and the eight pointed star represents the mariner's compass." This ensign formally replaced the Blue Ensign (now used by non-military government ships) during a ceremony at Telok Ayer Basin. The State Marine Ensign was created in 1960 and is used on all non-military vessels owned by the government, such as the Coast Guard. According to a construction sheet issued by the Ministry of Defence entitled State Marine Ensign and numbered Misc. 6 of 1960: "The State Marine Ensign shall be a blue ensign with the top left hand quarter of red charged with a crescent sided by five stars in a circle all in white and an eight pointed red and white star in the lower right hand quarter. The ratio of the width to the length of ensign shall be one to two. The colour blue is symbolic of the sea, the crescent and stars are from the State Flag and the eight pointed star represents the mariner's compass." ^ ), National Geographic Society (U.S (1918). "The Flags of the British Empire" (PDF). National Geographic Magazine. National Geographic Society. 32: 383. Retrieved 12 January 2009. ^ Foong, Choon Hon; Xie Song Shan (2006). ETERNAL VIGILANCE: The Price of Freedom. Singapore: Asiapac Books Pte Ltd. pp. 115–16. ISBN 981-229-395-7. ^ "Singapore, Flag of". Encyclopædia Britannica. 2008. Retrieved 14 September 2008. ^ Corfield, Justin J.; Robin Corfield (April 2006). Encyclopedia of Singapore. Rowman & Littlefield Publishers, Inc. p. 68. ISBN 0-8108-5347-7. ^ a b Toh, Chin Chye (1989). "Dr. Toh Chin Chye [oral history interview, accession no. A1063, reel 1]" (Interview). National Archives of Singapore. : "State symbols". Access to Archives Online (a2o), National Archives of Singapore. Archived from the original on 8 February 2012. Retrieved 4 November 2007. ^ Zaubidah Mohamed (18 December 2004). "The national flag of Singapore". Singapore Infopedia, National Library Board. Archived from the original on 6 May 2008. Retrieved 4 November 2007. ^ "National Pride" (PDF). Synergy. Contact Singapore. September – October 2009. Archived from the original (PDF) on 21 September 2010. Retrieved 15 December 2009. ^ "State symbols". Access to Archives Online (a2o), National Archives of Singapore. Archived from the original on 8 February 2012. Retrieved 4 November 2007. ^ "Road to Independence – Merger With Malaysia". Singapore Press Holdings. 1998. Archived from the original on 13 October 2013. Retrieved 30 November 2009. ^ "National Symbols and References: The National Flag". Singapore Infomap. Ministry of Information, Communications and the Arts. 2004. Archived from the original on 27 April 2009. Retrieved 16 October 2007. ^ Lee, Kuan Yew (1998). The Singapore Story: Memoirs of Lee Kuan Yew. Singapore: Times Editions. pp. 342–343. ISBN 981-204-983-5. ^ Syed Muhd Khairudin Aljunied (August 2009). "Sustaining Islamic Activism in Secular Environments: The Muhammadiyah Movement in Singapore" (PDF). Asia Research Institute Working Paper Series No. 120. National University of Singapore. Retrieved 15 December 2009. ; Syed Muhd Khairudin Aljunied, 'The Role of Hadramis in Post-Second World War Singapore – A Reinterpretation', Immigrants & Minorities 25, 2, p. 167. ^ a b "National Symbols – The National Flag". MyStory. National Heritage Board. 2009. Archived from the original on 17 June 2010. Retrieved 17 December 2009. ^ a b c d "National Symbols and References: The National Flag— Guidelines". Singapore Infomap. Ministry of Information, Communication and the Arts. Archived from the original on 12 May 2009. Retrieved 16 October 2007. ^ Ministry of Information, Communications; the Arts (2001). The National Symbols Kit. Singapore: Ministry of Information, Communications and the Arts. p. 5. OCLC 49823410. ^ Mohamed, Zaubidah (21 December 1999). "The national flag of Singapore". Infopedia Singapore. National Library Board Singapore. Archived from the original on 6 May 2008. Retrieved 30 November 2009. ^ Ministry of Information, Communications; the Arts (2001). The National Symbols Kit. Singapore: Ministry of Information, Communications and the Arts. p. 7. ^ Singapore Arms and Flag and National Anthem Rules, r. 5(3). ^ Singapore Arms and Flag and National Anthem Rules, r. 6(3). ^ Singapore Arms and Flag and National Anthem Rules, r. 9(5). ^ a b "Singaporeans urged to fly the flag". BBC News. 3 January 2004. See also "Singapore loosens controls on flag-waving". Financial Times. 3 January 2004. ^ Noor Mohd Aziz (10 July 2006). "Rules relaxed for flying national flag". Channel NewsAsia. Retrieved 16 October 2007. ^ "Singapore Government media release: Displaying the national flag during National Day celebrations 2007". National Resilience Division, Ministry of Information, Communications and the Arts. 17 July 2007. Archived from the original on 15 August 2009. Retrieved 4 November 2007. ^ "USE THE NATIONAL FLAG DURING THE NATIONAL DAY CELEBRATIONS 2009". MINISTRY OF INFORMATION, COMMUNICATIONS AND THE ARTS. 14 July 2009. Archived from the original on 8 September 2009. Retrieved 10 December 2009. ^ "Singapore Arms and Flag and National Anthem Act (Cap. 296, 1985 Rev. Ed". Government of Singapore. 1985. Archived from the original (PDF) on 15 August 2009. Retrieved 19 November 2009. ^ Singapore Arms and Flag and National Anthem Rules, r. 14(2). The rule states: "Any person who knowingly — (a) does any act in relation to the Flag in contravention of the provisions of rule 5, 6, 7, 9(1), (2), (3) or (4) or 10(1); or (b) contravenes rule 8 or 9(6) in relation to the Flag, shall be guilty of an offence and shall be liable on conviction to a fine not exceeding $1,000." Treating the Flag with disrespect is a separate offence under r. 14(4), which states: "Any person, who without reasonable excuse, contravenes rule 4... shall be guilty of an offence and shall be liable on conviction to a fine not exceeding $1,000." An authorised officer may compound these offences by collecting from the person reasonably suspected of having committed the offence a sum of money not exceeding S$500: Singapore Arms and Flag and National Anthem (Composition of Offences) Rules 2007 (S 378/2007). ^ Singapore Arms and Flag and National Anthem Rules, r. 4(1). ^ Singapore Arms and Flag and National Anthem Rules, r. 4(2). ^ Singapore Arms and Flag and National Anthem Rules, r. 7(4). ^ Singapore Arms and Flag and National Anthem Rules, r. 7(8). ^ Singapore Arms and Flag and National Anthem Rules, r. 7(6). ^ Singapore Arms and Flag and National Anthem Rules, r. 7(1). ^ Singapore Arms and Flag and National Anthem Rules, r. 7(2) and r. 7(9)(a) (definition of "position of honour"). ^ Singapore Arms and Flag and National Anthem Rules, r. 7(3)(a) and r. 7(9)(b) (definition of "position of honour"). ^ Singapore Arms and Flag and National Anthem Rules, r. 7(3)(b). ^ Singapore Arms and Flag and National Anthem Rules, r. 7(5). ^ Singapore Arms and Flag and National Anthem Rules, r. 7(7). ^ Singapore Arms and Flag and National Anthem Rules, r. 5(1). ^ Singapore Arms and Flag and National Anthem Rules, r. 5(2). ^ Singapore Arms and Flag and National Anthem Rules, r. 6(1). ^ Singapore Arms and Flag and National Anthem Rules, r. 6(2). ^ "Receptacle" includes paper, plastic and refuse bags: r. 9(8). ^ Singapore Arms and Flag and National Anthem Rules, r. 9(1). ^ Singapore Arms and Flag and National Anthem Rules, r. 9(2). ^ Singapore Arms and Flag and National Anthem Rules, r. 9(6). This rule does not apply to the production by or on behalf of, or the display by, any Government department of its flag: r. 9(7). ^ Singapore Arms and Flag and National Anthem Rules, r. 9(4). ^ Singapore Arms and Flag and National Anthem Rules, r. 10. ^ Singapore Arms and Flag and National Anthem Rules, r. 9(3). ^ Our Army Customs and Traditions (PDF). Singapore: Ministry of Defence. 2006. p. 127. Archived from the original (PDF) on 3 October 2008. ^ Singapore Arms and Flag and National Anthem Rules, r. 8. ^ Leong, Laurence Wai-Teng (December 2001). "Consuming the Nation: National Day Parades in Singapore" (PDF). New Zealand Journal of Asian Studies. The New Zealand Asian Studies Society. 3 (2): 5 at 14. Retrieved 3 November 2007. ^ "Singapore Statutes Online – 1 – Singapore Arms and Flag and National Anthem Rules". Government of Singapore. Retrieved 30 July 2016. ^ "Mass participation— communities: Largest national flag formed by umbrellas". The Singapore Book of Records. 9 August 2007. Archived from the original on 12 May 2008. Retrieved 3 November 2007. ^ See, for instance, the following: para. 22 of Lee, Hsien Loong (17 May 1997). "National Education: Speech by BG Lee Hsien Loong, Deputy Prime Minister at the launch of National Education on Saturday 17 May 1997 at TCS TV Theatre at 9.30 am". Ministry of Education. Archived from the original on 30 April 2008. Retrieved 4 November 2007. Paragraph 18 of Teo, Chee Hean (8 July 2003). "Getting the fundamentals right: Speech by RADM (NS) Teo Chee Hean, Minister for Education and Second Minister for Defence at the NIE Teachers Investiture Ceremony at 2.30 pm on 8 Jul 2003 at the Singapore Indoor Stadium". Ministry of Education. Archived from the original on 6 March 2009. Retrieved 4 November 2007. Paragraph 3 of "Press release: Submission of proposals for privately-funded schools". Ministry of Education. 5 June 2006. Archived from the original on 7 May 2008. Retrieved 4 November 2007. ^ Section 37(1) of the Merchant Shipping Act (Cap. 179, 1996 Rev. Ed.). A master of a Singapore ship who fails without reasonable cause to comply with this section is guilty of an offence and is liable on conviction to a fine not exceeding S$1,000: s. 37(2). 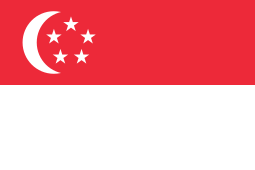 If any distinctive national colours other than the government ensign are hoisted on board any Singapore ship without official consent, the master of the ship or the owner if on board the ship— as well as every other person hoisting the colours— are guilty of an offence, and are liable on conviction to a fine not exceeding S$1,000: s. 36(2). ^ a b Lee Seng Kong (Director of Marine) (20 July 1999). "National colours for Singapore ships (MC No. 13 of 1999)". Maritime and Port Authority of Singapore. Archived from the original on 25 May 2011. Retrieved 4 December 2008. ^ Our Army Customs and Traditions (PDF). Singapore: Ministry of Defence. 2006. pp. 130–131. Archived from the original (PDF) on 3 October 2008. ^ For instance, after the death of former Second Deputy Prime Minister (1980–1985) and later Senior Minister (1985–1988) S. Rajaratnam on 22 February 2006, the national flag was flown at half-mast on all government buildings from 23 to 25 February 2006. ^ "One minute of silence to be observed throughout Singapore; SCDF will sound alert". Ministry of Community Development, Youth and Sports (republished on Getforme Singapore Online). 7 January 2005. Archived from the original on 23 October 2007. Retrieved 4 November 2007. ^ "Five Stars Arising". Sing Singapore. 2005. Archived from the original on 27 September 2007. Retrieved 16 October 2007. See also List of Singaporean patriotic songs. ^ a b c Teo, Faith (25 January 2003). "Art on the flag: A publicity stunt?". The New Paper. Archived from the original on 12 November 2007. Retrieved 4 November 2007. ^ Millard, Mike; Ivan Hall (2004). Jihad in Paradise: Islam and Politics in Southeast Asia. M. E. Sharpe. p. 125. ISBN 978-0-7656-1336-3. ^ Boehme, Olaf; Gerd Coordes; Chris Jagger (June 2005). The Rolling Stones: Fruit of the Loom Tour ; Licks World Tour 2002/2003. Norderstedt: Books on Demand GmbH. p. 120. ISBN 3-8334-2857-0. ^ Ong, Alexis (18 August 2008). "The Insider – the national flag". Time Out Singapore. Time Out Group Ltd. Retrieved 30 November 2009. ^ a b Au Yong, Esther (12 August 2007). "Popular bar slammed for cheeky use of stars & crescent of S'pore flag". The New Paper. Archived from the original on 12 November 2007. Retrieved 4 November 2007. ^ Ransom, Ian (25 November 2010). "Games-Skimpy trunks' design causes Singapore blushes". Reuters. Reuters. Retrieved 25 February 2012. ^ "Singapore Polo Team's Trunks "Inappropriate"". AP. CBS News. 26 November 2010. Retrieved 25 February 2012. ^ "Singapore Presidential Standard". Volker Preuß (in German). 9 September 2003. Retrieved 9 September 2003. ^ "Ceremonies and Protocol – The Presidential Standard". The Istana, Office of the President of the Republic of Singapore. 17 April 2008. Archived from the original on 19 December 2008. Retrieved 3 December 2008. ^ Herman Felani (1 November 2003). "War Ensign (Singapore)". Flags of the World. Retrieved 7 December 2008. ^ Ministry of the Interior and Defence (1967). "Singapore Naval Force ensign". Government of Singapore. Retrieved 19 November 2009. ^ Choy Choi Kee (7 May 1997). "1967 – Beginnings of the Singapore Navy". This Month in History. Joint Manpower Department, Ministry of Defence. Archived from the original on 7 October 2007. Retrieved 24 December 2008. ^ "Singapore State Marine". Volker Preuß (in German). 9 September 2003. Retrieved 30 November 2009. ^ "1960, Misc. 6 – State Marine ensign". Government of Singapore. 1960. Retrieved 30 November 2009. Smith, Whitney (1966). A History of the Symbols of Singapore. Flag Bulletin. 5. Winchester, Mass. : Flag Research Center. pp. 60–67. ISSN 0015-3370. .
"No conflict, clear-cut symbol of unity". The Sunday Times. 9 August 1981. p. 13. Aslaksen, Helmer (11 March 2007). "The mathematics and astronomy of the Singapore flag". Department of Mathematics, National University of Singapore. Archived from the original on 13 October 2007. Retrieved 3 November 2007. Singapore Legislative Assembly (1959). State Arms and Flag and National Anthem of Singapore (Legislative Assembly (New Series) Misc. 2 of 1959). Singapore: Printed at the Government Printing Office. State Arms & Flag of Singapore. Singapore: Publicity Division, Ministry of Culture. 1977. Crampton, William (1992). The World of Flags : A Pictorial History (Rev. ed.). London: Studio Editions. p. 88. The National Symbols Kit. Singapore: Prepared by Programmes Section, Ministry of Information and the Arts. 1999. A kit on the key symbols of Singapore consisting of eight fact sheets, one booklet, one CD and one national flag. Singapore Broadcasting Corporation (1988). Flag and Anthem, 3 December 1959 [videorecording]. Singapore: Television Corporation of Singapore. A documentary on the national flag and anthem of Singapore. Gives an account on how the present design of the flag was arrived at, and includes an interview with the national anthem's composer, Zubir Said. Wikimedia Commons has media related to Flags of Singapore. This page was last edited on 19 April 2019, at 19:39 (UTC).